Shiinotic in game: 172 Who? Important notice! Pokemon Shiinotic is a fictional character of humans. Shiinotic (Japanese: ???—? 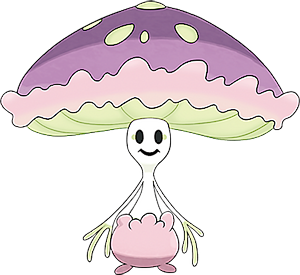 Mashedo) is a dual-type Grass/Fairy Pokémon introduced in Generation VII. 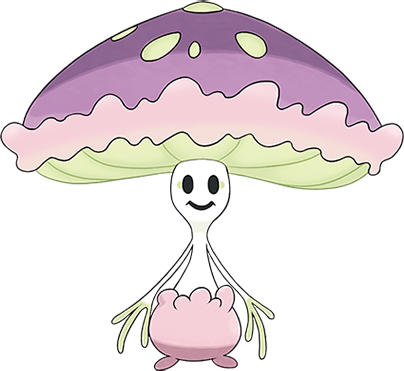 Shiinotic is a large, white Pokémon that resembles a mushroom. 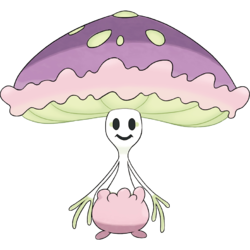 Its slim body is similar to a stalk, and it has a large, purple mushroom cap on its head. Its eyes are large and black with pale green half-circle markings on the outer side. Unlike its pre-evolution, it possesses a visible mouth, which is medium-sized and black. The ends of its long, thin arms split into three pale green tips that act as fingers. Its small feet and rounded lower half are light pink in color, and it has several small, light pink bumps around its midsection. The mushroom cap on its head possesses pale green oval markings and a pale green underside, which are capable of illuminating. Living in forests, Shiinotic fights over territory with Parasect. The strange lights that it emits can confuse people who enter its habitat at night, causing them to be unable to ever find their way home again. The flickering spores that it releases cause drowsiness. It takes advantage when its prey is asleep, feeding on them by sucking in their energy. Shiinotic may be based on bioluminescent mushrooms such as those of the genus Mycena. It also features a volval sac and wide brimmed warty cap, which are trademarks of the Amanita family. Both families are known to grow in fairy rings. From its name, Shiinotic may have some aspects of the shiitake mushroom, as well. Shiinotic may be a combination of shiitake and hypnotic. Mashedo may be a combination of mushroom and shade.